First deposit bonus: 200% on first deposit. Spin of the Deck for additional bonus if deposit is £10 or more. £5 Love2Shop Voucher if first deposit at least £10. 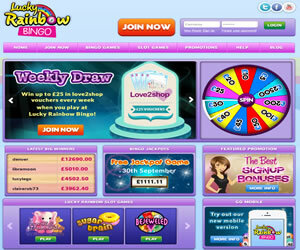 Lucky Rainbow Bingo arrived on the online bingo scene in late August 2014 and with the launch came an array of exclusive welcome offers to the brand. Upon opening the site boasted 96 free tickets for a £1,111 jackpot game, no deposit required and then the standard deal for a first deposit that we were used to from the 15 Network but with an additional £5 Love2Shop voucher if the first transaction was for a minimum of £10. We’ve yet to see how long these bonuses remain in place. When you land on the homepage the overall layout of the site is as expected from a brand on the 15 Network. The design suits the Lucky Rainbow Bingo theme with a colourful aesthetic and of course, rainbows. Even the wheel has a myriad of colours similar to those found on a rainbow. There’s even pot of gold shown on the landing page and as you scroll down, a slightly Irish them with a leprechaun and shamrocks dotted about. As with all sites on this network, registration is a straightforward process with no requirement to enter your financial details in order to sign up and check out what the brand has to offer. Within a couple of minutes you are ready to visit the hub of the site, the lobby. From the lobby you can see several different tabs, each offering a variety of games. There are 75 ball pattern and 90 ball bingo games to choose from as well as a selection of instant win games. Each have their own tab and you can view an array of information for each of the bingo games rooms. You will see the host name (if one is on duty), the ticket price, the house prize and how many players are in the room. When you have chosen the room that suits your needs, you’ll see that the layout is standard to sites whose bingo games are powered by the Jumpman Gaming software. To the left of your screen are you bingo tickets with game details above. These details include the prize breakdown and whether the game boasts 1TG / 2TG / 3TG prizes too. You’ll also see your purchasing options above the tickets and the number of players in the game as well as the number of tickets you have purchased. 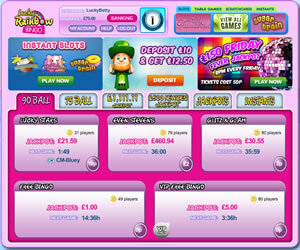 To the right of the screen is the chat room at Lucky Rainbow Bingo, this is where you can interact with other players and the hosts as well as play for bonuses. Immediately above chat is the mini game (default is Fluffy Favourites) and then above that is a selection of other instant win games. At the top of the screen is the ticket price for the current game and your account balance. 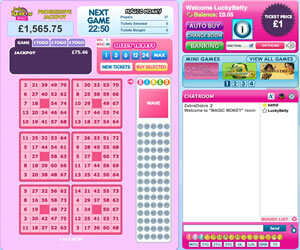 Lucky Rainbow Bingo has a number of jackpot games available to pre-buy – most of these are networked games. Additionally there are the two progressive jackpots on offer, one 75 ball and one 90 ball. The other promotions listed on the dedicated page consist of the usual network offerings – Team Bingo, Monday Madness, Lucky Lotto etc. The site does have some exclusives but at the time of the review, actual details were a little scarce – this could just be something that was overlooked in the rush to launch and may appear at the site later. When all is said and done Lucky Rainbow Bingo may be a networked brand but it looks to be thinking outside of the proverbial box. 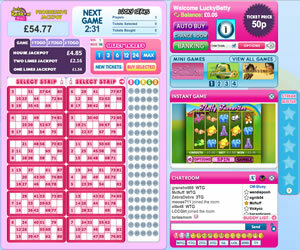 At launch, Lucky Rainbow Bingo only offered two types of bingo game at their site. You will find 75 ball pattern games and 90 ball bingo. In addition there are a number of slots and instant win games available including favourites like Sugar Train and Fluffy Favourites. Deposits of at least £10 are required to Spin the Wheel for an additional bonus and the £5 Love2Shop voucher. Lucky Rainbow Bingo do not have specific wagering requirements. So long as you have wagered at least £30 with the site you can withdraw. You should note that at the point of withdrawal all bonus funds and loyalty points are removed from your account.